I went out for a drive this morning. The global warming is killing me. That all men have a natural and indefeasible right to worship Almighty God according to the dictates of their own conscience. Tennessee is my home State. I am thankful that the Constitution of my State affirms my right to worship Almighty God according to the dictates of my conscience. However, federal law trumps State law, and one day this freedom may be taken away in its entirety. Nevertheless, the right to worship God is not a right given by Tennessee or Washington, D.C.; it is a commandment given by the Almighty, Himself. The dictates of any constitution will have no bearing on the command to “go into all the world and preach the gospel,” including Tennessee. There are some things in life that we always go back to when nothing else seems to do. It’s called comfort food. Comfort food is the stuff that you want to eat when you’re depressed, when you’ve lost a limb, or when you’re girlfriend informs you that all along she has been an alien from Jupiter, and now she wants your brain to take back to her daddy. Comfort food brings back fond memories of childhood and the “good-old-days” (unless you were a starving refugee), when Mom could make you feel better with nothing more than a spoonful of lard and some corn meal. Here in the southern United States we have a custom: when somebody dies, we eat. Whenever a loved one passes away, bites the dust, or essentially assumes room temperature for an indefinite period of time, we trot them off to a funeral home, and then bring in every kind of unhealthy food imaginable. We all know that when one is suffering a terrible loss, comfort food will help dull the pain. And if nothing else, it will help you get to where your loved one is a little quicker than a salad will. A typical southern funeral home has a dining area. This is where the family and friends can go when they are tired of standing around in the viewing room. They instinctively know that in that room is food which will make them feel better. Well, not long ago my only blood-related uncle went home to be with the Lord. His body was taken to a funeral home in a place called Whitwell (pronounced “Wutwool“), Tennessee. And it was there that the funeral home staff did something that it does for all their families – serve homemade pinto beans. Now, don’t be fooled, folks. These are not your ordinary beans. These are about the best pinto beans you will ever put in your ever-loving mouth! 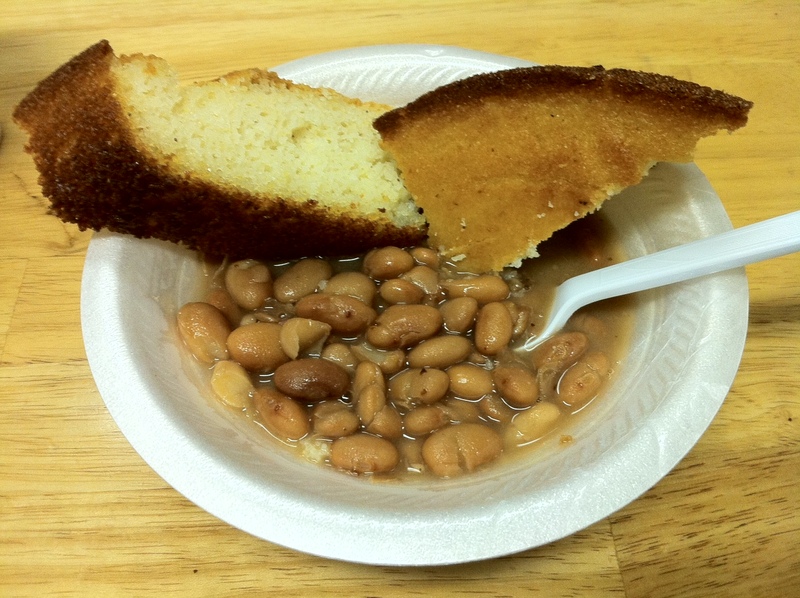 Served with some homemade cornbread, these beans made me tear up (no joke) as I remembered my granny, my dad, and a much, MUCH simpler life down on the river. What makes these pintos so special is that they were soaked for 24 hours in water, then slow-cooked the next day in a crock pot with several slices of thick bacon. Of course, there’s more to it than that, but there are secrets to keep. Why do we prepare such food for funerals? Seriously? For one thing, sometimes it is hard to find the right words to say when someone is hurting. That’s when people do what they can, and many times the only thing they can do is prepare good food. Hurting people need to be cared for, and this is one way to show it. Comforting one another is also something we are commanded to do. 1Thessalonians 5:11 tells us to “comfort yourselves together, and edify one another.” And speaking of the hope of resurrection we have in Christ, the Apostle Paul said in the same letter, “comfort one another with these words” (1 Thess. 4:8). But what happens when words are hard to find? Make a pot of seriously savory pinto beans and cornbread. Tears of heartache may turn into tears of culinary joy. This past weekend I went with my wife to a retreat/conference for bivocational pastors and their wives. 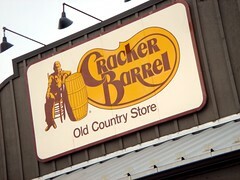 It was sponsored by the Tennessee Baptist Convention and was held in Pigeon Forge, TN. Believe it or not, not all pastors fly jets, have mansions, drive new cars, or wear $1,000 suits. Most pastors drive used cars, live modestly, fly only when they have to, and get their suits only when they’re on sale. Even though the pastors most people see on television have thousands of members in their churches, the average size of the typical congregation is only in the 80’s or less. The average pastor has to work a second job, does not have a secretary, and can’t afford a personal hair stylist. The men I spent time with last weekend were the real deal: humble, hardworking, men of God. They were the real deal, the genuine article. One thing that people tend to forget is that pastors are people, too. They have families, bills, and a list of their own issues. They have problems like the rest of everybody, it’s just that it’s hard to share them with the congregations they serve. A lot of people accuse Christians of thinking we have it all together, but we don’t. As a matter of fact, what makes us better pastors is when God allows us to go through struggles and trials and all the associated pain in order for us to have first-hand knowledge of His grace. On the first night of the conference I attended, in a breakout session for the men, one particular pastor poured his heart out about his wayward 19-year-old son. He wept as he said, “What I need is some hope.” It didn’t take long before this brother, this wounded spiritual warrior, was brought up to the front of the room. There, as he knelt beside a table, the rest of us wept with him, prayed with him, and encouraged him. How did we encourage him? It’s because we were real people fighting some of the same battles, feeling some of the same hurts, and he knew he was not alone. THESE are the REAL pastors. These are the real deal. These are NOT the men wanting your money; they’re the ones who’d give you their last dollar. These are the men who care for your souls. These are the real men of God you should get behind and support. I am so thankful to the TBC and all those who made this minister’s and wives retreat possible. I’m also thankful for the grace of God. We are not alone, even when no one else will stand with us. But when we do stand, and kneel, and weep, and rejoice with each other…oh, what a formidable force we are! Yesterday, on Facebook, I read a post comparing conservatives in Tennessee to the Taliban. Yes, the Taliban. Was it meant in jest? Was it simply sarcasm? Was it some form of sophisticated humor far above my intellectual capabilities? In any case, I did not find it humorous, but offensive. Let me quote to you what the author wrote, but just in case I’m missing something, I won’t name names – since the Taliban might get offended, and you know how that could go. It’s easy to come down hard on unloving, graceless, legalistic Christians (or at least those who claim to be) when they try to push their beliefs. 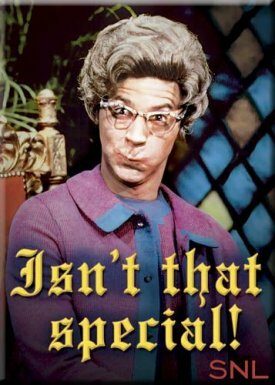 I mean, if all you ever experience is the literal version of Dana Carvey‘s SNL character Church Lady, then that kind of self-righteous, churchy, hate mongering is easy to condemn. But in reality, the ones my friend (yes, it’s a friend) were comparing to the Taliban are those who strongly believe abortion is wrong, that wine sales should be confined to the liquor store, and that one shouldn’t have to check his religion at the door when either voting or running for office. The Tennessee “church ladies” were even likened to Taliban because of their supposed hypocritical support for a less-than-godly candidate. But is the Taliban characterization fair? I don’t think so. With the exception of the insane radical who has no clue what it means to follow Christ (yet claims to be a Christian), even the most conservative of conservatives, even the most severely Independent Fundamental Bapticostalite-type is nothing, NOTHING like the Taliban! For example, let’s compare reactions. Last week a Baptist church in my town was savagely vandalized. What did we do? We prayed that justice would be done, that the vandal would be caught, AND that our community could find a way to show him the love of Christ. What would the Taliban have done in the same situation? Well, as a clue, just last week a missionary friend informed us of a couple in his town that was burned alive after being accused of burning some pages from the Koran. The 26 year-old couple, parents of 4, were repeatedly thrown onto a fire as they pleaded their innocence. But hey, those Christians were taught a lesson, weren’t they? 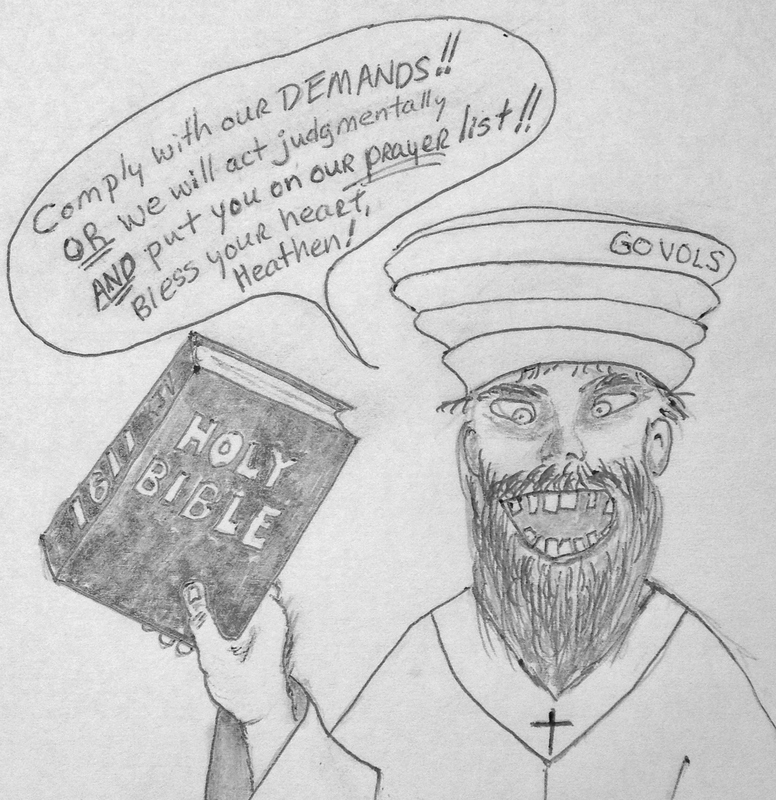 Had the Christians in Lookout Valley, Tennessee, been the Taliban, we would have united after our morning prayers, then killed the teenager who destroyed the church. After that, like so often is the case with Muslim mobs, we would have looted, raped, and crucified anyone who looked like an atheist or liberal, then burned our own businesses – just to make a point. But we didn’t, did we? And what about that election? What about those dreadfully religious, abortion-regulating votes? You mean those votes cast in a fair election after which no one was shot, beheaded, or blown up by a car bomb? You mean the election to which women were allowed to drive themselves? You mean that election we actually HAD?! So, what’s my point? It does not further the quest for Christian unity and understanding when we intentionally use blatantly derogatory labels to demonize those with whom we disagree, especially when we agree on far more things than we don’t. If my interpretation of the reason for using the “Taliban” term was flawed, then I sincerely apologize. I understand, as pointed out by my wife and children, I can blow things way out of context. But, if I was, as I suspect, lumped in with those who kill those with whom they find the least bit of variance, I’m hurt. Labeling those who were only doing their civic duty, and had they lost would have only complained and whined, as the “Taliban” was an unfortunate use of words. But unlike the Taliban, we will forgive.